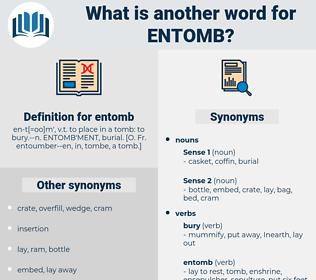 What is another word for entomb? 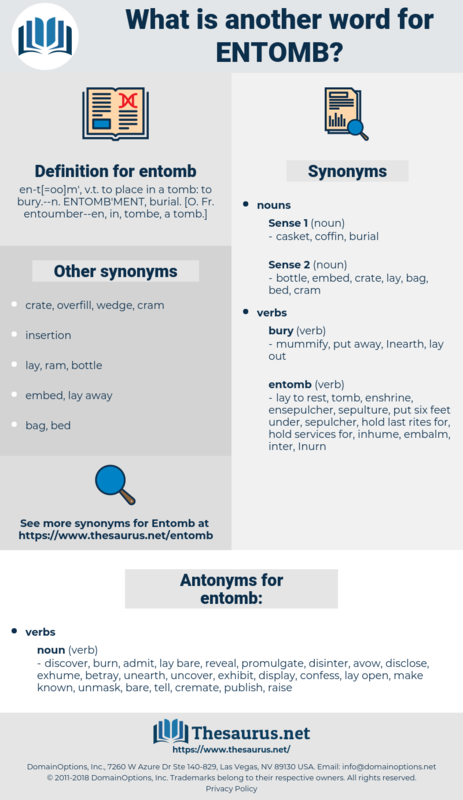 discover, burn, admit, lay bare, reveal, promulgate, disinter, avow, disclose, exhume, betray, unearth, uncover, exhibit, display, confess, lay open, make known, unmask, bare, tell, cremate, publish, raise, show, expose, unveil, divulge, manifest, uncoffin, advertise. The present eye praises the present object: Then marvel not, thou great and complete man, That all the Greeks begin to worship Ajax; Since things in motion sooner catch the eye Than what not stirs: The cry went once on thee, And still it might, and yet it may again, If thou wouldst not entomb thyself alive, And case thy reputation in thy tent; Whose glorious deeds, did but in these fields of late, Made emulous missions 'mongst the gods themselves, And drave great Mars to faction.